This year, I've been fortunate enough to be blessed with a devotional called Mornings with Jesus: Daily Encouragement for your Soul. Written by seven women, including at least a couple authors I've reviewed before (Judy Baer and Tricia Goyer), this is a devotional that I actually do keep reaching for. With different people writing the entries, there is just enough of a change of approach day-to-day to keep me interested and coming back. I love the format. It is so very easy to read, and the "faith step" part often leaves me pondering the message for a good part of my day. Take this morning, for instance. The Bible verse is Galatians 6:2. Keri Wyatt Kent talks about how she is able to easily avoid "the oppressed" in her everyday life... but then goes on to talk about how her life -- and that of her entire family -- was "forever changed" when they did step out and reached out to the oppressed. Touching story. Part of the faith step suggested that you "figure out ways in which you avoid those in need, and ... begin to change that." This one is going to stick with me for more than just today. And I can see ignoring the days of the week on this, and re-reading it in 2013 or 2018 or whenever. The sections may start with a day and date, but they certainly appear to be timeless. I will be continuing to read this throughout this year. Disclaimer: I received this book and a book to give away through LitFuse Blog Tour. No other compensation was received. All opinions expressed in this review are my own. Im interested in any book that can help me grow closer and more knowledgeable in Christ! I'm interested in all day with Jesus. I would love a new devotional to use in my quiet times with Christ! Hi Debra. I'm brand new to your blog. I just happened upon it and now I'm a follower too. I love devotionals they make my day start out better and my night calmer. This one looks great and I would love to have a chance to use it daily. P.S. love your profile picture. Oh' btw - I've got 3 giveaways going on now. I'd love you to visit and enter. 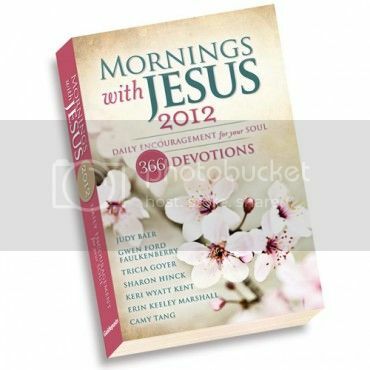 The book sounds like a simple way to start the day focused on Jesus and I like the fact that you are still thinking about it later in the day. That's great! I had been looking for a good devotional. I think this would be good.